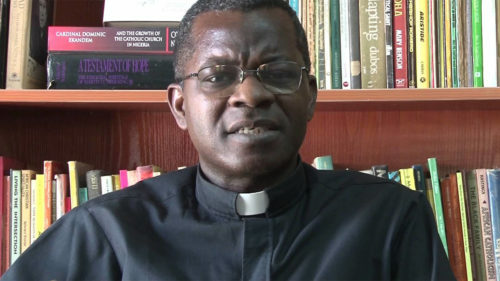 The video which has gone viral on social media, shows Nigeria’s Reverend Father George Ehusani, speaking against the culture of inheritance. The clergyman argued that children that inherit wealth from their parents are never-do-wells while those whose parents never leave anything for them to inherit do better in life. Last week, we were talking about people who foolishly make provision of houses for their children and grand children. It is the most foolish thing reason been that every child comes into this world with a brain. and the Lord has granted each child some ingenuity. When you provide everything your child needs, you stunt the growth of your child. You deny the world that unique gift that your child was to bring to the world. When you build houses for your child, and make provisions for a comfortable life for your child, the natural talents and gift the child comes into the world with, they remain dormant. It is a serious issue. because those who have accomplished the most in this world are not people whose parents provided properties for. Today, wealth is being created when a smart child, for example, in his father’s garage takes a laptop and develops apps. They are among the richest people in the world. What did the father provide? Education and the child uses what he came into the world with.